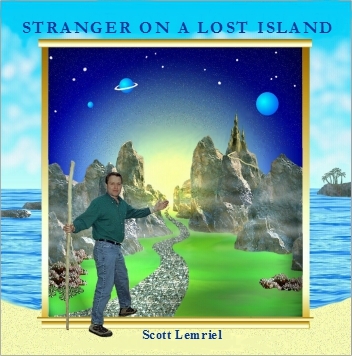 Take a journey through your own imagination with R. Scott Lemriel’s music from the Stranger On A Lost Island Music CD – one 1 of 7 planed albums, while you listen to long snips of all ten song tracks on the Stranger On A Lost Island music album. The spontaneous creation of track 10 called Lemuria, many years ago, led to the creation of The Parallel Time Trilogy screenplays and books, The Seres Agenda book, and ever so much more. * Hear long demo snips of each album track above. The album tracks move in a special order of expanding conscious awareness or enlightenment. As the composer, I am sharing this experience with you. The 1st title track of Stranger On A Lost Island, the last track titled Lemuria, and all the other songs between them express a depth of what was discovered about other worlds. They document experiences this artist encountered with benevolent beings that live on other worlds and in other higher dimensional realities, as well as recalled past lives or journeys along the past time track. Perhaps you will find them stimulating your own recall of who you really are as a being, how you came to be on planet Earth in this lifetime, and what your true co-creative destiny with the source behind all life really is all about. If this fellow human being author can explore, experience, and recall this, any of you can too. Special Note #1: This journey into discovering deliberately hidden truth expanded over the course of this lifetime via my music excursions, inner travels, and hidden truth revealing writing about what was experienced. However, the discovery of many lives lived in other realities were directly involved in this recovery. Special Note #2: What was taken from me without my consent or awareness long ago that was recovered and that is continuing to be ever more deeply recovered is being shared with all of you. How this was accomplished is also being share with others for their benefit too. This is the true motivation for all that I do these days as a book & screenplay author, feature film and episodic tv developer, video producer, music composer and International Speaker demonstrating hidden truth and the safe protected way to access it.